Many have asked how I get around and how is my leg "dressed". So, for those who need a "visual", here you go. As you can see, my walker is very plain.. nothing fancy. I basically "hop" on my good leg since I cannot put any pressure on my right leg. 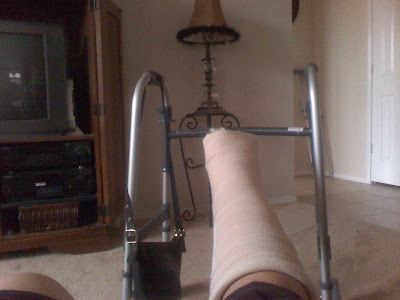 My leg has a splint that starts out straight, they wet it and it forms to my foot and goes up the back of my leg. They then put a mesh material over my foot and leg, and finish it up with ace bandages. As I mentioned before, I might get a partial cast on my next visit - which will definitely warrant more pictures. This is the bag I am currently using. 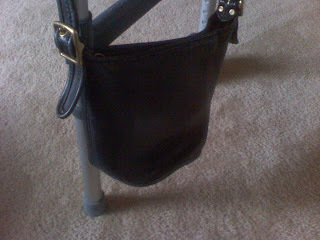 (Yes, it's vintage Coach) It has to hold my cell phone, house phone, remote control, meds, lip balm, etc. as I move between my office at the breakfast table and the recliner (where I elevate my leg in the evenings). It also carries my shampoo/conditioner from bathroom to kitchen so I can wash my hair. So, you can see how I might "covet" The Buxton Organizer Bag! It holds all your crap AND 2 BOTTLES OF WATER!!! This reminds me of the bag from the 1970's commercial... remember it wasn't as sleek, but your keys "snapped" on the inside of the purse. I thought it was the coolest purse ever, and I wanted it in "bone". (c'mon, I was like 7 years old)... Now, I want the new one in RED... because I have better taste now. Be careful - when you click on this link - it's a commercial.. so don't let the sound scare you. Well, it was just a month ago that every day I'd dread going to the gym after work.. and some days, I'd give in to the dread, and not go... now, I'm sitting here wishing I could go. It's funny how you don't really appreciate something fully until it's taken away from you - even if it's temporarily. The Dr assured me that I will have full use of my leg - it's just a matter of when. I hope that when the time comes, that I continue to appreciate the privilege and not grow to dread it as time goes by. All I know is now that I'm anxious and can't wait. They've already changed the name on me.. It was White Rock Gym, and it is now "Gold's Gym"... which is cool. That was only being gone a week. I hate missing stuff. I only hope the "pricing" doesn't change now that we're a part one of the top 2 gyms in the country. The one good thing is that they put my account on hold for payment for 3 months due to medical condition. Well, I plan on weighing this weekend - even though it will be skewed from the weight of the splint.. I think I can get a baseline - because the goal now is to definitely NOT GAIN ANY WEIGHT... if I lose some, even better! Earlier I kept thinking as I'm working at my makeshift desk at the breakfast room table.. if I only had the EASY CURVES. I could be at least giving my breasts a lift. Oh My Gah... I just cannot watch daytime TV. These are some of my favorite things. I have resisted the temptation so far, but not sure how much longer I can hold out.